When a tooth is lost, it’s important to restore your mouth to its proper function and appearance with a permanent replacement, such as a dental implant or a bridge. Recently, the implant system has received the lion’s share of attention (for some good reasons); however, in certain situations, dental bridgework offers a viable alternative. What would cause one method to be favored over the other? In general, implants are now considered the gold standard for tooth replacement. They have the highest success rate (over 95 percent), last the longest (quite possibly the rest of your life), and don’t affect the integrity of adjacent teeth. 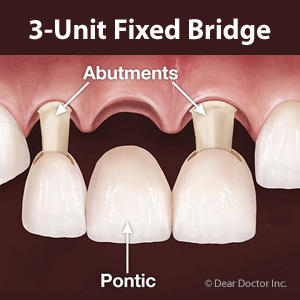 Bridges, by contrast, require the removal of tooth structure from adjacent teeth, which can potentially compromise their health. Yet implants aren’t necessarily ideal for every situation. When might a bridge be preferred? Some people don’t have the proper quantity or quality of bone in the jaw to support an implant; or, they may have anatomical structures (nerves or sinuses) located where they would interfere with an implant. It is possible in some cases to work around these obstacles with bone grafts, or by placing implants in alternate locations; in other cases, a bridge may be a better option. While most tolerate the implant process quite well, a few people aren’t good candidates for the surgical procedure required to place an implant. Certain systemic diseases (uncontrolled diabetes, for example), the use of particular medications, or a compromised immune system may make even minor surgery an unacceptable risk. In these cases, a decision may be made after consulting with an individual’s other health care providers. Additionally, a few behaviors or lifestyle issues, like heavy smoking or a teeth-grinding habit, tend to make implants have a less favorable success rate. There are also a few circumstances that could argue in favor of a bridge — for example, if you already have a need for crowns on the teeth adjacent to the gap, it can make the process of getting bridgework easier and more economical. Financial issues are often an important consideration in planning treatment — but it’s important to remember that while bridges are generally less expensive than implants in the short term, the much longer expected life of implants can make them more cost-effective in the long run.